NASA's Robonaut 2 ground unit is seen with a mannequin during telemedicine training for ultrasound and injection tests. Robonaut 2 is a dextrous humanoid robot designed to help astronauts in space with a variety of tasks. NASA is training a humanoid space robot to pull double duty as an emergency doctor in space — a surrogate physician that could one day be controlled by experts on Earth to help sick or injured astronauts. The $2.5 million Robonaut 2, nicknamed R2, is designed to work alongside the astronauts and even take over some of their more tedious duties inside and outside the International Space Station. The new NASA training is adding telemedicine skills to that mix. In a new video of Robonaut 2's telemedicine training, the automaton performed an ultrasound scan on a mannequin and even used a syringe like it would to administer a real-life injection. The tests were performed using a ground-based version of R2 robot, the mechanical twin of the one currently aboard the space station. NASA's Robonaut 2 robot holds a syringe in gloved hands in this video still from a telemedicine training test using the dextrous humaoid robot. "I would say that within an hour I trained him more than with other students I'm working for a week, so I think that he's learning really fast," Dr. Zsolt Garami, of the Houston Methodist Research Institute, says in the video. Far from earthly hospitals, astronauts who currently live on space station, typically in six-month-long stints, must be trained in basic surgery and medical procedures in case of an emergency. But Robonaut 2, which has a camera-equipped head, could administer care to spaceflyers, controlled by doctors on the ground. 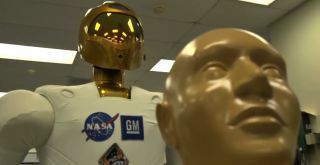 So far, tests with Robonaut 2 have shown that human controllers can perform tasks "correctly and efficiently by using R2's dexterity to apply the appropriate level of force and can track their progress using R2's vision system," NASA officials explained in a video description. Garami said the robot might eventually be able to learn to do some tasks on its own. NASA's Robonaut 2 and Dr. Zsolt Garami, of the Houston Methodist Research Institute, practice telemedicine techniques during a test of the robot's bedside manner. This image is a still from a NASA video documenting the Robonaut 2 test. Robonaut 2's telemedical skills could be useful on Earth, too, allowing doctors to conduct complex medical procedures on humans in remote locations, according to NASA. The space-bound Robonaut 2 launched to the International Space Station as just a torso with arms in 2011 during the final flight of the space shuttle Discovery. That Robonaut 2 will get legs, a set of high-tech limbs with seven joints each, sometime later this year, NASA officials have said.